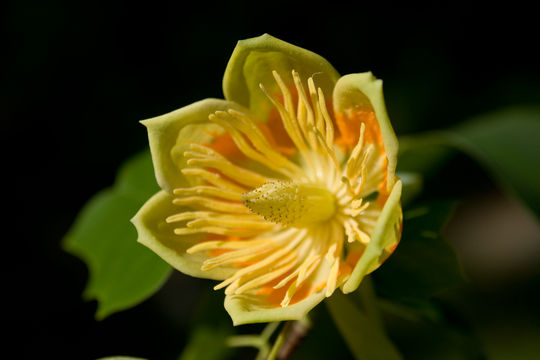 Tulip Tree scientifically known as Liriodendron tulipifera is a large, stately, deciduous tree of the Liriodendron L. genus and Magnoliaceae (Magnolia family). 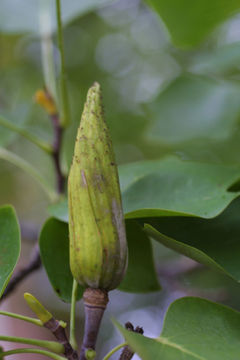 The plant is native to eastern North America from Southern Ontario and Illinois eastward to Connecticut and southern New York, and south to central Florida and Louisiana. 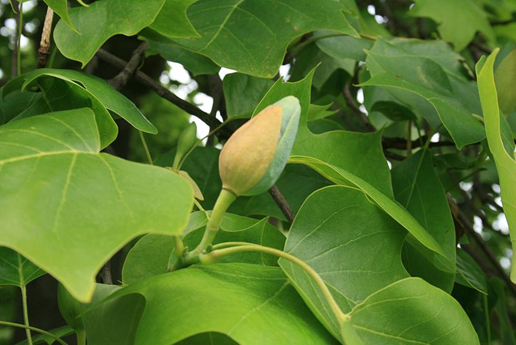 Some of the popular common names of the plant are Bois-jaune, Canary whitewood, Tulip poplar, Tuliptree, Yellow poplar, Tulip tree, American Tulip Tree, Canoewood, Fiddle-tree, Saddle-tree, Tulip Magnolia, whitewood, White poplar, tulip magnolia, blue poplar and yellow wood. 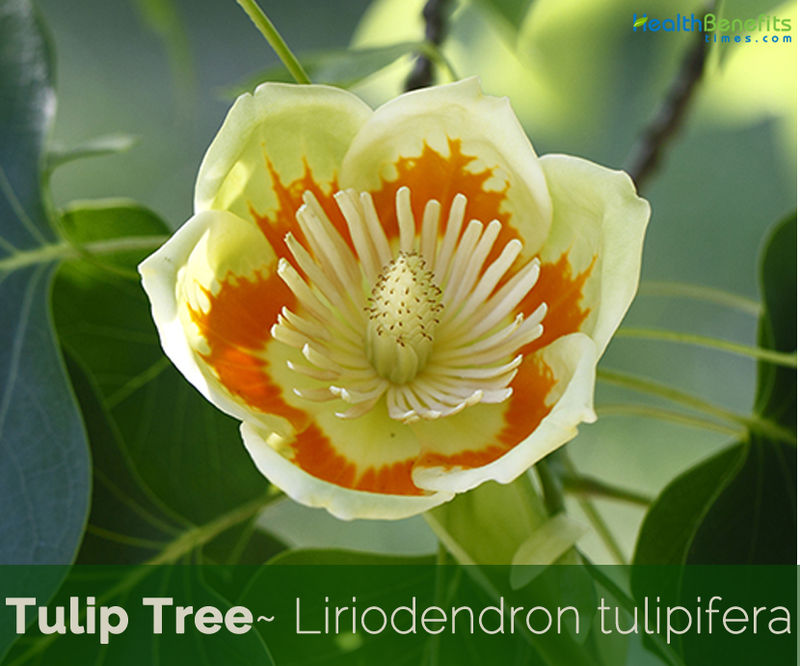 Genus name comes from the Greek words leirion meaning a lily and dendron meaning a tree for the flowers. Specific epithet means tulip bearing for the form of the flowers. 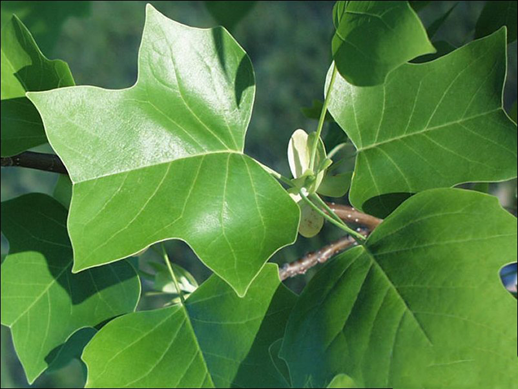 Tulip Tree is a tall, deciduous, long-lived, broadleaf tree that grows about 190 feet (58 m), with a trunk 10 feet (3 m) in diameter. Its ordinary height is 70 feet (21 m) to 100 feet (30 m). Twigs are slender, reddish-brown, and sometimes purplish, with many small specks (lenticels). The pith is diaphragmed. Bark is dark green on young stems, becoming gray with small, white patches, later streaked with narrow lines; with fine, deep furrows. 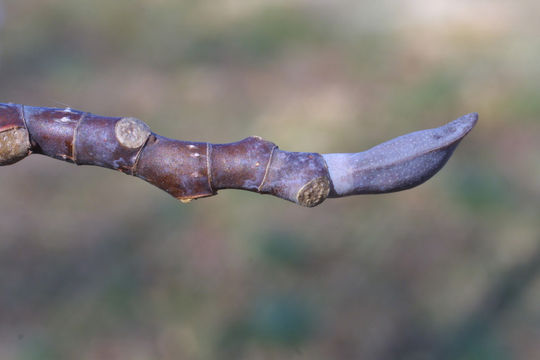 Branchlets are smooth, and lustrous, initially reddish, maturing to dark gray, and finally brown. Wood is light yellow to brown, and the sapwood is creamy white, light, soft, brittle, close and straight-grained. Wood is used inter alia for furniture, plywood, boatbuilding, paper pulp and general lumber. Native Americans made dugout canoes from tuliptree trunks. Alternate leaves are simple, pinnately veined, measuring five to six inches long and wide. They have four lobes, and are heart-shaped or truncate or slightly wedge-shaped at base, entire, and the apex cut across at a shallow angle, making the upper part of the leaf look square. Midrib and primary veins are prominent. 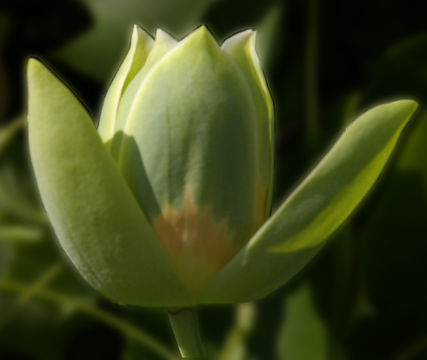 They come out of the bud recurved by the bending down of the petiole near the middle bringing the apex of the folded leaf to the base of the bud, light green, when full grown are bright green, smooth and shining above, paler green beneath, with downy veins. In autumn they turn a clear, bright yellow. Petiole is long, slender, angled. It is named and noted for its cup-shaped, tulip-like flowers that bloom in spring. Flowers are yellow with an orange band at the base of each petal. Although the flowers are 2 inches in length, they can go unnoticed on large trees because the flowers appear after the leaves are fully developed. Sometimes the flowers are first noticed when the attractive petals begin to fall below the tree. Perfect, solitary, terminal, greenish yellow flowers are borne on stout peduncles, an inch and a half to two inches long, cup-shaped, erect, conspicuous. 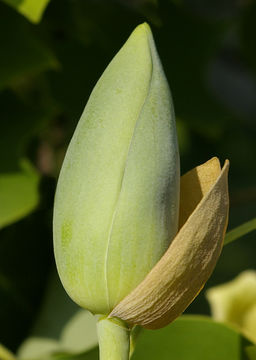 The bud is enclosed in a sheath of two triangular bracts which fall as the blossom opens. 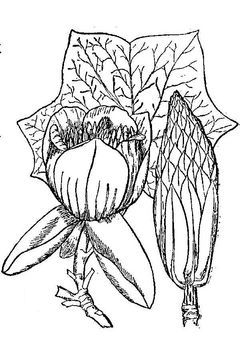 Flowers are followed by dry, scaly, oblong, cone-shaped light brown fruits two to three inches long, each bearing numerous winged seeds on a central stalk. 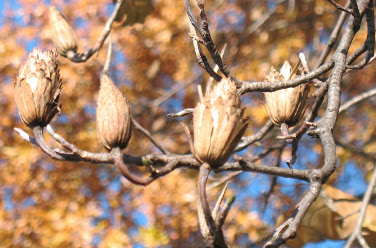 The seeds sit upright in pyramidal clusters, turning brown in October and persisting through winter. The broad, flat wing of the samara enables it to be carried a long distance by the wind. The seeds, which in the greater number of the samaras are abortive, in the fertile fruit are one or two in number and are contained in a small cavity at the base of each samara. 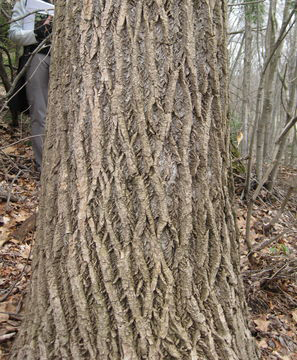 Intensely acrid bitter inner bark, especially of the roots, is used domestically as a diuretic, tonic and stimulant. Raw green bark is also chewed as an aphrodisiac. Bark contains ‘tulipiferine’, which is said to exert powerful effects on the heart and nervous system. Tea is used in the treatment of indigestion, dysentery, rheumatism, coughs, fevers etc. Externally, the tea is used as a wash and a poultice on wounds and boils. Root bark and the seeds have both been used to expel worms from the body. Bruised leaves used to treat cephalalgia. 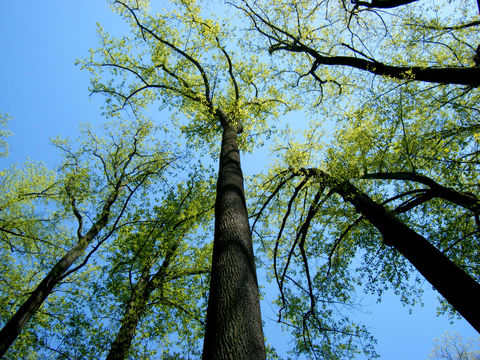 Yellow-poplar was used medicinally in the late 1800’s: a heart stimulant was extracted from the inner bark of the root, and a tonic for treating rheumatism and dyspepsia was extracted from stem bark. 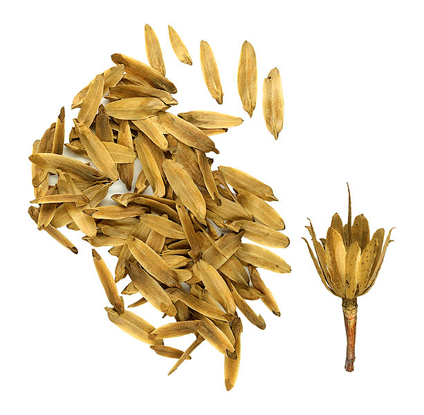 Inner bark tea is used for periodic fevers, diarrhea, and pinworms, as a digestive aid and for rheumatic pain. Bark could also serve as a substitute for quinine in treating malaria. 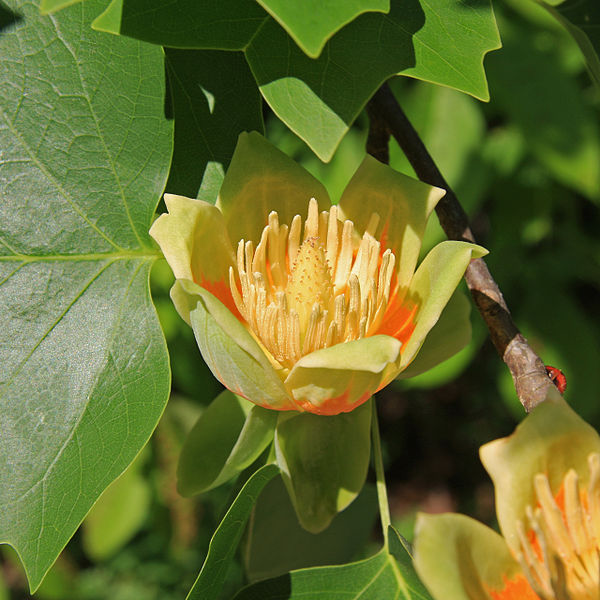 Poultices and ointments made from tulip tree leaves and buds were used by Native Americans, including the Cherokee, for wounds, burns and inflammation. Some Native Americans also used the leaves in decoctions to treat arthritis. Root is used as a lemon-like flavoring in spruce beer, where it also serves to correct the bitterness of the beer. Bark of the root and branches has a pleasant rather pungent scent. Gold-colored dye is obtained from the bark. Wood fine grained, soft, light is much used for interior finishes, furniture, construction and plywood. Native North Americans used the tree for making canoes. Flowers are also valuable nectar producers. Yellow-poplar has been valued as an ornamental since 1663. Flowers from a 20-year-old tree produce enough nectar to yield 4 pounds (1.8 kg) of honey. 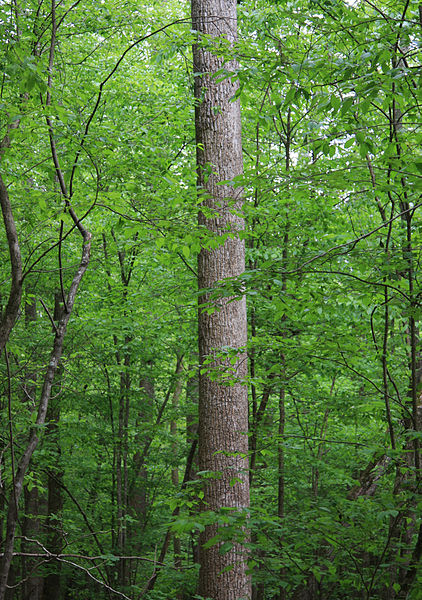 Yellow-poplar wood is used for construction grade lumber and plywood. In the past it was used for carriage bodies, shingles, saddle frames, and interior finish wood. 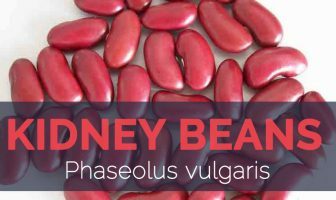 It is currently used for cabinets, veneer, furniture, and pulp. Yellow-poplars in various stages of growth provide hiding and thermal cover for white-tailed deer, small mammals, upland game birds, waterfowl, and nongame birds. Fruits provide food for squirrels in the late fall and winter months, and the white-tailed deer often browse on the twigs. Outer bark is crafted into berry baskets, arrow quivers, and larger pack baskets. Outer bark slabs used for shingles and siding on shelters. It is the state tree of Kentucky, Tennessee and Indiana. Take 15 drops as needed, or use topically as a muscle liniment. Bark Dark green on young stems, becoming gray with small, white patches, later streaked with narrow lines; with fine, deep furrows. Leaf Alternate leaves are simple, pinnately veined, measuring five to six inches long and wide. They have four lobes, and are heart-shaped or truncate or slightly wedge-shaped at base, entire, and the apex cut across at a shallow angle, making the upper part of the leaf look square. 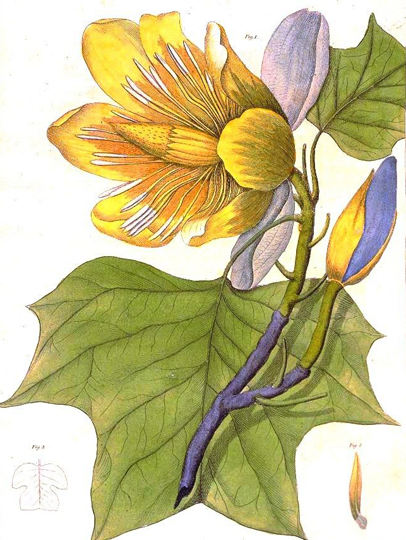 Liriodendron tulipifera var. integrifolium G.Kirchn.